I have long been a fan of inquiry in the classroom but getting students to ask questions is not easy. The best part of learning occurs when we identify the gap between what is known and what we want to know. This is not territory that should be owned by the teacher. I used to start with: what do you wonder? Then I moved to using a provocation like a short video, a story, or an article and then asking: what do you already know and what do you want to know. 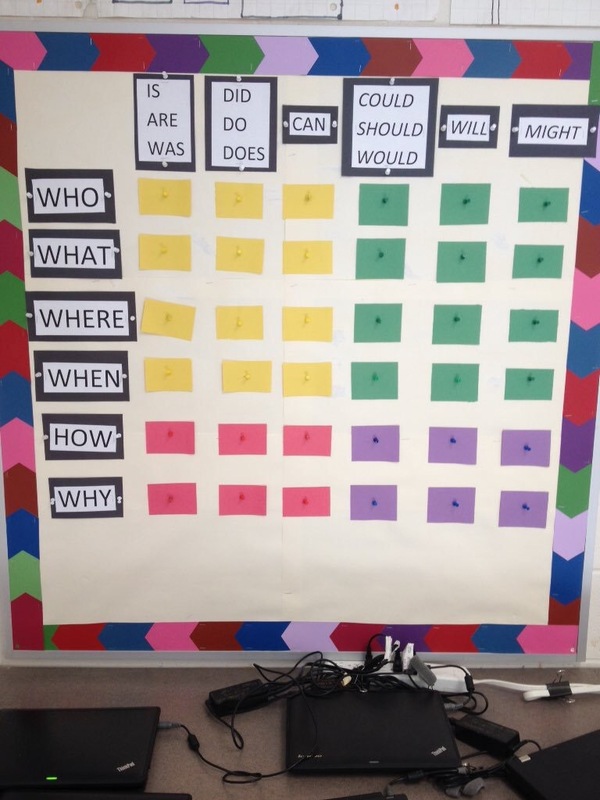 This lead to “the wonder wall” where students started with headings: what I think I know, what I want to know, what I have learned or verified, where I found my information, and ideas that turned out to be wrong. 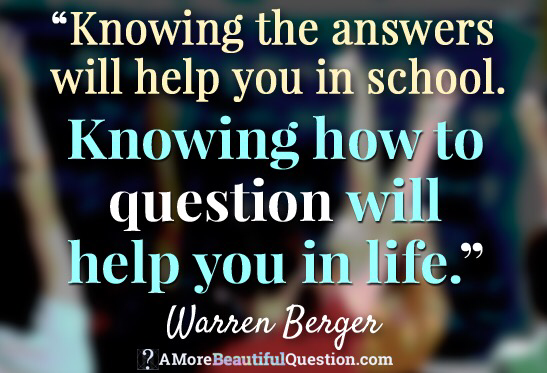 I still struggled with getting students to ask good questions. Moving beyond questions that can be answered yes or no or can be settled with a quick google search like a late night bar bet is a challenge. We used see, think, wonder to guide our inquiry (observer, réfléchir, se poser des questions). We started with a short provocation of looking for any information we could find about topics related to Tunisia (food, buildings, celebrations) and connected to what we knew about Calgary and the two countries we have already studied: Peru and India. Then we started asking questions. The book On the Way To School and the film by the same name provided powerful inspiration for asking questions. Of course the formula doesn’t work in every situation. Consider the question: What is truth? It falls into the yellow category, which might be considered a less interesting question but it is a deep question. The formula is just a starting place to get students moving beyond “googleable knowledge”. Coming to deep questions is a long process but I really think the resulting learning is so much deeper and as students use questions to collaborate on a shared work product they will have the opportunity to learn from one another. 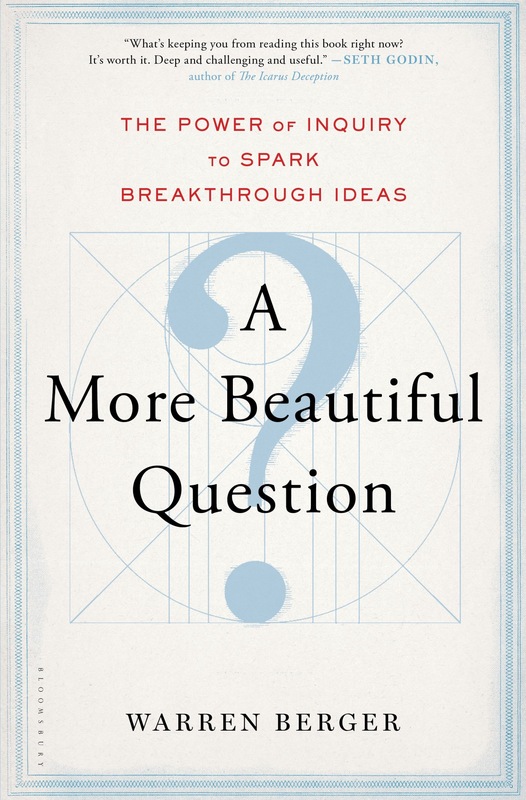 I’m currently working my way through this book and looking forward to asking better questions myself and to helping students ask better questions. My take away so far: Warren Berger suggests designers use three questions that spark innovation: Why? What if…? How? Once upon a time there was a writer, turned teacher, turned writer… Turned teacher/writer. Good teachers at our hearts are essentially story tellers. We know story hooks children into the learning whether the topic be children in South Sudan or the quadratic equation, minds wander to why. “So how are you gonna make money?…” They would ask. “I’m going to be a writer…” I’d repeat. Finally, I found that the freelance life wasn’t working for our family. I couldn’t be up all day with kids and work at 10 o’clock at night to deliver a document at 6 o’clock in the morning. So I quit. I’m back in the classroom where I seriously love to be. I am doing a masters degree and have a love for reading and writing about teaching and learning that allows me to marry my loves together into pretty much my dream job. I think every teacher brings something amazing and different to the table. Part of what I love about teaching are the many varied talents of my colleagues. Not every teacher is a writer; I know plenty of teachers were or are something different in their lives outside of school (sales people, secretaries, personal trainers… the list is endless). But I do think blogging is accessible to every teacher. It’s cheap. It’s accessible. It opens our practice to discussion. Blogging is a reflective practice; it is important because it makes visible that reflection that often occurs in our heads, on the way home after work, while cooking, while running, while waiting to fall asleep at night. Does the “publish” button sometimes make me take a long pause? You bet. My admin reads my blog. Potential employers may see what I write. Potential PhD panels may see it in the future and decide I’m not the candidate they are looking for. At the least (or maybe at the most), though, I hope that I can demonstrate blogging is a place for reflection and interaction. It is a place to celebrate success but it is also a place to share what doesn’t work for me and to seek opinions. Not every teacher brings “writer” baggage to the table, but every teacher can and should blog. It’s the opportunity to make visible the reflective practice that so often happens as teachers. It’s not only what happens in our classrooms that makes us professional educators but also the reflection on best practices, on assessment and evaluation, on feedback, on knowing our students that makes us true professionals. Anybody can stick a shiny sticker on a spelling test with 100% written on the top. Not everyone knows how or why that might not be best classroom practice. The truth is that teachers are one part craftsman, honing a skill that can be passed from one practitioner to the next, one part artist, storyteller, dramatic artist, engaging students in the magic of learning, for when it’s done well, any story is narrative art. Recently, I found myself in a “Yoga for Runners” class and had an “aha” moment about my teaching. How often as an adult do we find ourselves in the position of learning something new? Not nearly often enough is my answer, especially if we are teachers. I have been a runner since I was a teenager. I don’t claim to be very fast or to be able to go very far, but I do LOVE it. I decided to add yoga to the routine because all I was doing was pounding my body with the same old same old four times a week. I have done yoga before but it never really “took”. I do love the dim lights and the quiet, the incense and the chanting, but I am the kind of girl who needs a runners’ high. I want to feel like I have worked hard. I never really felt like I was amongst my tribe. I showed up in my running tights and thought, “meh… They’ll do the trick.” Little did I expect every other yogi and yogini to look like me! The room was full of Nike and Sugoi and not the hemp and bamboo I had expected. They all had feet like me: rough, and bent. Every other yoga class I had been to was full of people who seemed to respect their feet more than I did, but this class seemed to be full of people more interested in where their feet could take them. I found power in knowing every one of those runners had a tight front body and a weak back body. Camel pose that goes straight up and down at best? Yup, that’s me. There is power in finding people with like interests. I found myself wanting feedback rather than wanting to disappear into the background. The teacher demonstrated, described, and provided feedback. She used words, a demonstration, and sometimes a hands-on realignment of our position. I was not afraid to get it wrong! Rather, I was more concerned with getting it right. There is power in being allowed to make mistakes. Several times she said, “There is no judgement only practice.” That right there? That blew my mind! I was not right or wrong but on a continuum towards my best me. How freeing to not be afraid to get it wrong! She provided us with feedback and then let us try each position again. The feedback came in the middle of the practice, not at the end where I would have forgotten before the next session. There is power in just-in-time feedback. She guided us to the ropes and wall hooks where I was incredibly intimidated: what torture device is this? But she made it fun! My first inversion! Did I look like a fool on the outside? Probably. Did I feel like a five-year-old on the playground on the inside? Absolutely! Let’s not forget the value of play in the classroom! There is power in fun! The class was Robin Hilton’s Hips and Hams at the Bodhi Tree and I highly recommend it. I also highly recommend putting yourself in the student role occasionally and experiencing the slight discomfort of learning something new. Today my students scored a pretty fun afternoon, and I’m pretty pleased with the results of their work. After spending some time on Pinterest, I was inspired to adapt this art project for my students’ work with the Grade 4 curriculum’s unit on rocks and minerals and the Grade 5 curriculum’s unit on weather. This lesson covered so much: science, language arts, art perspective. One of my students even remarked: Mme! We’re having fun, but we’re learning, too! 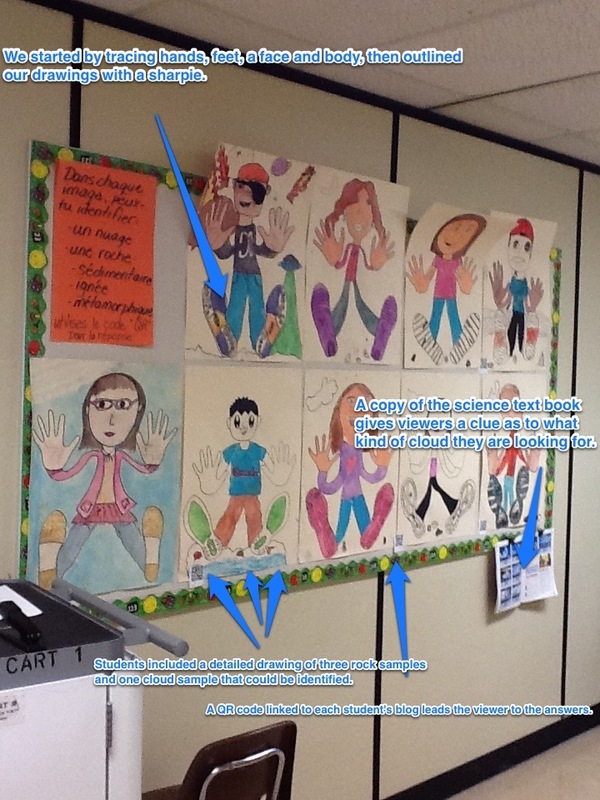 The students traced their hands and feet, then they drew their faces and bodies. Students were required to include three rock samples and one cloud sample, all of which could be identified by a viewer. After drawing, students outlined their work with a sharpie and painted with water colour. Finally, students blogged their rock and cloud samples and a QR code posted next to their work takes viewers to their site. I loved this project and I think students were pretty pleased too! Author tevansPosted on November 16, 2012 January 23, 2016 Categories ReflectionTags art, clouds, minerals, Pinterest, rocks, scienceLeave a comment on Pinterest, FTW!